Over time, your skin's ability to renew itself slows. Skin loses its elasticity and wrinkles become more evident. As your skin cell turnover continues to slow, wrinkles become deeper and more settled. 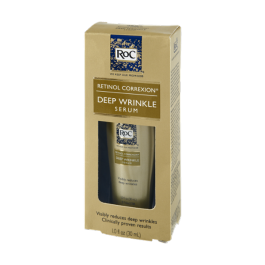 RoC Retinol Correxion Deep Wrinkle Serum stimulates your skin's renewal process and is clinically proven to visibly reduce both fine lines and deep wrinkles. This light, silky fluid glides on easily and absorbs quickly, leaving your skin feeling smooth and velvety. The formula's patented technology combines pure RoC Retinol with magnesium, zinc, and copper to stimulate the skin's renewal process and bring newer, younger-looking skin to the surface. In addition, DMAE - a high performance tightening agent - works to visibly firm and tone the skin. Deep wrinkles on face and neck are visibly reduced. Tested to minimize the risk of allergic reaction. Noncomedogenic - won't clog pores. RoC has been the leading French skincare brand for over 40 years, devoted to developing anti-aging products that guarantee visible and lasting results for healthier, younger-looking skin. Strong partnerships with dermatologists have contributed to our expertise in understanding skincare and developing clinically proven products, which are highly effective, yet suitable for all skin types. Use once or twice a day in the AM and/or PM. Cleanse skin and allow time to dry. Smooth product over face and neck allowing product to absorb completely. You may experience a slight tingling or tightness during use. This is normal and is a sign that the product is working. Discontinue use if skin irritation develops and lasts. Follow with a gentle moisturizer or makeup if desired. If applying an additional moisturizer, use one free of retinol or alpha hydroxy acid. Apply a sunscreen of SPF 15 or higher during the day while using this product. Continue using a sunscreen for one week after stopping use. This product contains an alpha hydroxy acid - AHA - that may increase your skin's sensitivity to the sun and particularly the possibility of sunburn. Use a sunscreen, wear protective clothing and limit sun exposure while using this product and for a week afterwards.